A leading manufacturer of personal care products and kitchen appliances, Conair, a $2- billion-plus multinational corporation, has built a hospitality business that offers a full line of high-quality in-room amenities for virtually every possible accommodation. The Conair Hospitality division has been developing and manufacturing products specifically for the hospitality industry for more than 15 years. Along with Conair-branded hair dryers, mirrors, steam irons and clock radios, this diverse product ensemble also consists of products from other globally recognized brands, including Cuisinart and Waring Pro. 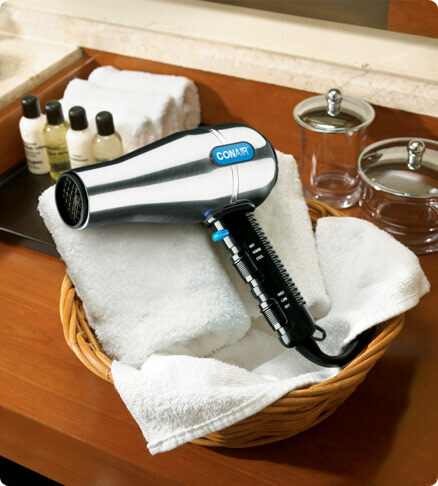 At the heart of the Conair Hospitality assortment are the company´s hair dryers. The industry leader for more than 50 years, Conair is synonymous with professional performance. In 1970, the company reinforced its reputation for innovation by revolutionizing the grooming habits of consumers worldwide with the introduction of the pistol-grip hair dryer. For extended stay and timeshare, Conair Hospitality also offers a full line of small appliances and cookware under its Cuisinart and Waring Pro brands. Whether it´s a brief overnight or a long-term stay, Conair Hospitality helps to ensure that guests are receiving top-shelf service with a high-performance product assortment that represents the best in its class. Guests will take comfort in using products bearing the brand names of the Conair Hospitality family – the trusted brands they have at home, and number one choice of consumers for decades.